We can all understand the confidence that comes with glowing skin—the way it makes you glow on the inside, too. On the flip side, we’ve all felt the pang of irritation triggered by an unexpected blemish or rash. Ultimately, everyone wants to feel good and look good—and IMAGE Skincare exists to help you achieve that. But around the world, there are millions of individuals experiencing skin conditions that aren’t easily remedied with skin care and a visit to an aesthetician—these people suffer from skin loss and don’t have the resources to restore it, which impedes them from living their lives to their full potential. As skin experts who appreciate the emotional and social impact that skin can have, we wanted to help in a larger way. In 2011, board-certified plastic surgeon Dr. Marc Ronert, Clinical Director & President at IMAGE Skincare, founded the Care for Skin Foundation, a nonprofit organization created to support people who suffer from skin loss due to accidents, tumors, burns, scars or genetic abnormalities (such as cleft lips and palates). The simple goal? To restore skin to those who otherwise cannot afford these types of surgeries, ultimately and hopefully transforming their lives. Two of the most widespread causes of skin loss is burn wounds and genetics (notably children born with cleft lips and palates). Burn wounds aren’t only a physical representation of a distressing and painful injury, but they’re also a considerable cause of disease, disfigurement, psychological trauma and even death among children. And reports estimate that nearly 11 million people bear severe skin burns every year—and the vast majority, a whopping 95%, occur in developing countries where people cannot afford nor have access to proper medical care to ensure healthy healing. These wounds, then, remain untreated and turn into scars that can sometimes obstruct people from performing simple tasks like walking or caring for their children. Cleft lips and palates are birth defects that occur because a baby’s lip or roof of the mouth doesn’t develop normally during pregnancy. About 170,000 children are born with either or both defects every year. A cleft lip and palate causes a multitude of physical disabilities for children. It can impair speech, causing the child to mispronounce words, speak unclearly or create involuntary noises through the nose because of the airway between the nose and mouth. The condition can also cause someone to talk with a lower tone (this is called hypernasal speech). Hypernasal speech can be so severe that researchers estimate up to 30% of children can still have it even after one surgical procedure. Cleft lip and palates can also make it very difficult for a person to consume food and beverages, which can then cause a child to become undernourished. The increased risk of infection can even be fatal. Children with cleft palate are also vulnerable to other problems, including ear infections and subsequent hearing loss or issues with the teeth and jaw. Physical disfigurements also have profound emotional, mental and psychological effects. They can carry social stigma in certain cultures, creating a rift between a child and his family or the community, which can negatively influence self-esteem, productivity and happiness. Depending on the clef, the surgery needed for repair can be as low as $250 to $450 and can be performed in as little as 45 minutes. Now that’s a simple way to change a life forever. Care for Skin Foundation sends physicians, including Dr. Ronert, to these disadvantaged communities to provide free care to those most in need. To be part of the global change and help a child grow up to love the skin they’re in, donate at www.careforskin.org. IMAGE Skincare takes care of all administrative costs, so 100% of your donation goes to support the patients. There’s a second way to contribute (if you don’t believe in karma, you will now): by simply investing in healthy, moisturized lips, you can automatically give another new skin. Good skin for good skin. 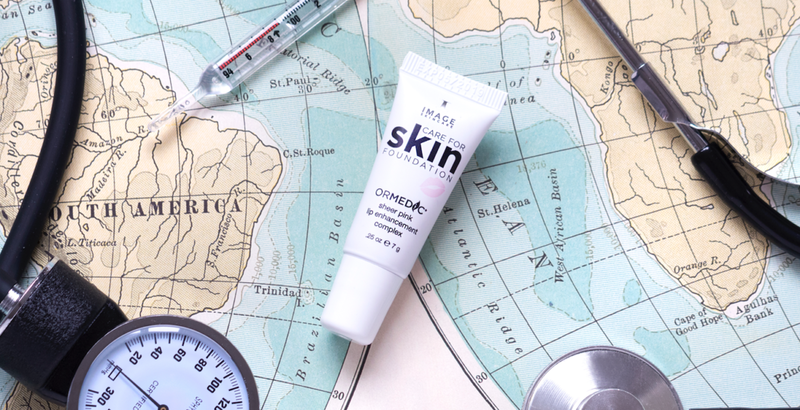 For every purchase of ORMEDIC sheer pink lip enhancement complex, IMAGE will donate $1 to the Care for Skin Foundation. Just one use and this lip-enhancing moisturizer drenches lips with incredible hydration from fatty-acid-rich avocado oil, all while improving the volume of lip contours and adding a newfound fullness. An anti-aging polypeptide complex helps support collagen so your puckers stay firmer and pliable for longer, and the look of fine lines are visibly softened. Potent antioxidants like Coenzyme Q10 and vitamin protect your skin from the aging effects of free radical damage. With regular use, your lips will enjoy continuous moisture and healing. Take it from our customer Marie M., who says “Not only do my lips stay super hydrated but they definitely look & feel more full. And the pink tint is an added bonus…. Beautiful shade and not overbearing.” A great reward for a great cause. Are you in?